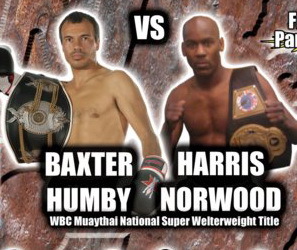 WCK Muay Thai returns to Los Angeles, California and the vacant WBC Muay Thai United States National Super Welter Weight Title will be decided between Baxter Humby and Harris Norwood. Baxter has over the years won the IMTC world Muay Thai champion title among many other world championship titles and has competed consistently nationally and internationally. Harris has 27 wins, 11 losses and is a two time Shidokan champion. Shidokan is the event accurately called the triathalon of combat martial arts including grappling and kickboxing. Also on the card Joey Pagliuso will fight Shane Oblonsky who recently had a victorious journey to Henan, China on the Wu Len Feng event. In the USA Pagliuso has been establishing a reputation as a heavy handed fighter with dangerous power in either hand. Artem Sharoshkin is a strong California amateur and will be matched against Ozzy Venegas with the winner claiming the IAMTF U.S.A. National title. All bouts will be under full Muay Thai rules. The fight night starts at 8 p.m. Parking is free. Tickets are priced at $40-$100. For tickets please call 1-877-446-7962. You can also visit WCK Muay Thai’s site for more details. Good to see the amateurs being developed by WCK Muay Thai on their return to Los Angeles. ~ by fatsoking on May 19, 2010.